2017 was a great year to be in the news business. It seemed to me that “disruption” was the word of the year, as so many tumultuous events filled the calendar. Major earthquakes in Mexico, monstrous hurricanes in the Caribbean, furious fires in the West were matched by mass shootings, scandals from Hollywood to Alabama and the sideshow of events emanating from Washington D.C. Major shifts in the way we live, once theoretical, are becoming realized. We have heard much about disruptors like Airbnb, Uber, and Amazon, but when and who will be the disruptors that affect the housing industry? Simultaneously, we in the industry are coping with labor shortages, continuing mergers of epic proportions, and rising construction costs. I, for one, won’t miss 2017. With the dawn of a new year, we can focus on the future, hopefully with a clean slate. It is an opportunity to take the concerns of the past year and work toward solutions that, in the end, will create a stronger sense of community. I am encouraged that many of our clients are looking seriously at changes to the development process to create attainable housing. We are talking about modular and manufactured construction techniques, serious investigation of net-zero energy, right-size design, and back-to-basics ideals. We need to look at the delivery of homes from top to bottom to reduce costs, time, finance, and sales methods while maximizing space and lifestyle. “Sustainable design” is now commonplace, so engrained in the way we do things that lead to healthier environments that save water and energy; but we can think farther. How can our projects be more durable to better withstand what Mother Nature can throw at us? We hear “retail is dead,” but I know of many centers where, on a nice weekend, I cannot believe the crowds. These centers have adapted to become the social hearts of their communities, places where neighbors interact, “Third Place” environments. The changing nature of grocery stores may allow smaller, more neighborhood-oriented markets so we can walk to the store for fresh groceries, check our parcels, and grab a coffee with neighbors. What “dead retail” exists provides a redevelopment opportunity for new life that could feature mixed-use projects, creating a finer grain of development to our cities. Last year, I attended a session at the IBS show on home automation. One presenter, an editor of a tech magazine, reported that she attended every Consumer Electronics Show and decreed that, for the first time, she felt the future has fully arrived, with home automation readily attainable for every home. Amazon Echo and the like have the ability to simplify our lives so we can devote more time to other activities. Our homes can watch over us and our children, keeping us comfortable and safe (yikes!). I am fascinated by the discussion of the coming autonomous car. Will it change our thinking about buying or leasing? (Yes.) Will it mean that we can repurpose our garages? (Yes.) Will it mean that we don’t need large parking lots? (Maybe.) What about reduction of traffic? (Hmmm.) Or, will it create more traffic when cars are circling the block waiting for their customers, or people living even farther from work? Redevelopment of needless parking lots will be a huge opportunity for new infill housing. Autonomous trucks will eliminate a large work force of truckers. We need to focus on retraining and introducing them to the construction industry to fill a large void. We are the housing specialists, so seeing the utter devastation after natural disasters makes me think that the homebuilding industry could develop a comprehensive emergency plan for dealing with devastated communities like Santa Rosa, where seven percent of the housing stock was destroyed in the fires. This would go beyond FEMA to include rapid deployment of emergency shelters, expediting procedures for reconstruction, and housing for construction workers during the rebuild, and coordination with insurance and lenders. We need to develop a strategy to minimize the disruption of lives that can be used wherever the need exists. 2018 can be a transformative year as we look to what lies behind the curtain of disruption, to sift through the ashes of the past year, and boldly embark on developing strategies for keen and clever solutions to better home, housing, and community. 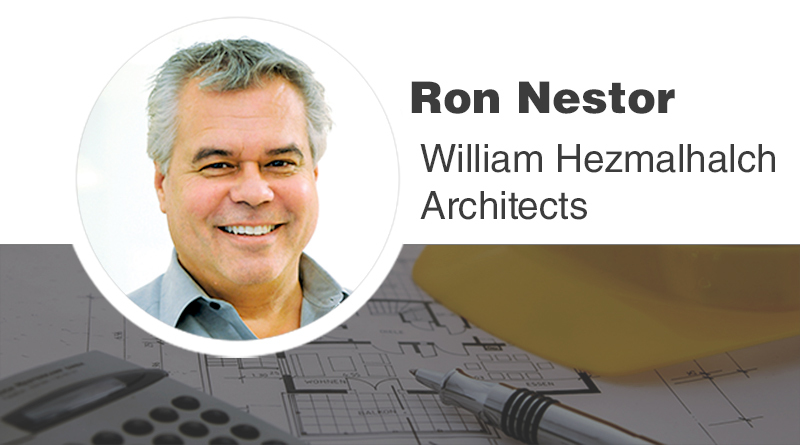 Ron Nestor, AIA, LEED AP, is a Senior Principal with WHA – William Hezmalhalch Architects, Inc. of Santa Ana, Long Beach and San Ramon, California. He may be reached at ronn@whain.com.